RUSSIA: Dozens of orcas and beluga whales captured for sale to oceanariums have brought Russia’s murky trade into the spotlight, but efforts to free them are blocked by government infighting. Russia is the only country where orcas, or killer whales, and belugas can be caught in the ocean for the purpose of “education”. The legal loophole has been used to export them, especially to satisfy demand in China’s growing network of ocean theme parks. 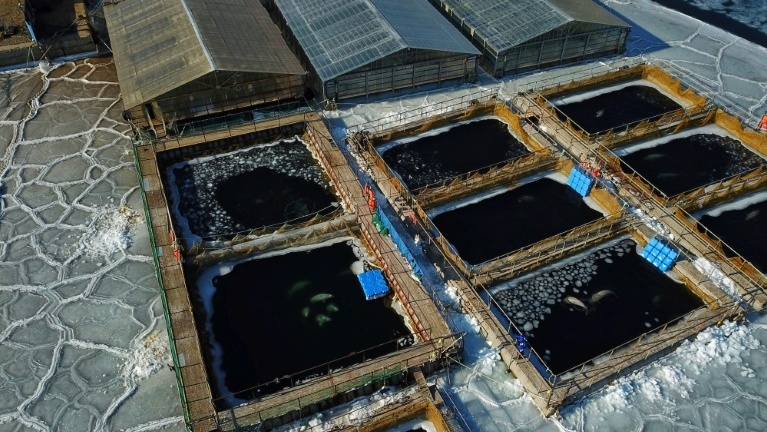 The practice sparked a global outcry after pictures surfaced of an unprecedented number of the marine mammals – a total of 11 orcas and 87 belugas – crammed into small enclosures at a secure facility in the Far Eastern town of Nakhodka. “There have never been that many animals caught in one season and kept in the same facility before anywhere in the world,” said Dmitry Lisitsyn, head of the Sakhalin Environmental Watch group who has emerged as a point person in the campaign to release the whales captured last summer back into the wild. Under public pressure, Russian investigators launched two probes into poaching and cruel treatment of the whales, while Russia’s environmental watchdog said it has refused to issue permits to export them. But the investigations and any potential court case could drag on for months. And a major hurdle remains in the Russian government which is split between the environment ministry that says the animals must be urgently released, and the fisheries agency that defends their capture as part of a legitimate industry. The captured killer whales belong to the rarer seal-eating, or transient population of the species, which does not interbreed or interact with fish-eating orcas. The environment ministry has tried to list the seal-eating type as endangered, ministry representative Olga Krever said. “This population has only 200 adult animals” in Russian waters, she said. The heads of the two ministries could sit down and decide the fate of the Nakhodka animals quickly as “this needs a political solution,” she said. But while marine mammal researchers say there are good chances of a successful release, the fisheries agency told AFP that releasing the captured animals “carries high risks of their mass death”. “Neither orcas nor belugas are endangered,” and are simply a resource that can be used according to existing legislation, agency representative Sergei Golovinov said. The high-profile clash became heated at a Moscow conference last week where Alexander Pozdnyakov, a fishing lobbyist tied to firms keeping the animals in Nakhodka, suddenly linked it to Russia’s geopolitical struggle with the United States. What he failed to mention is that catching wild orcas stopped in both the United States and Canada in the 1970s due to public opposition. There are 74 operational ocean theme parks in mainland China featuring whales and dolphins, according to the China Cetacean Alliance, which monitors the industry. More are under construction. 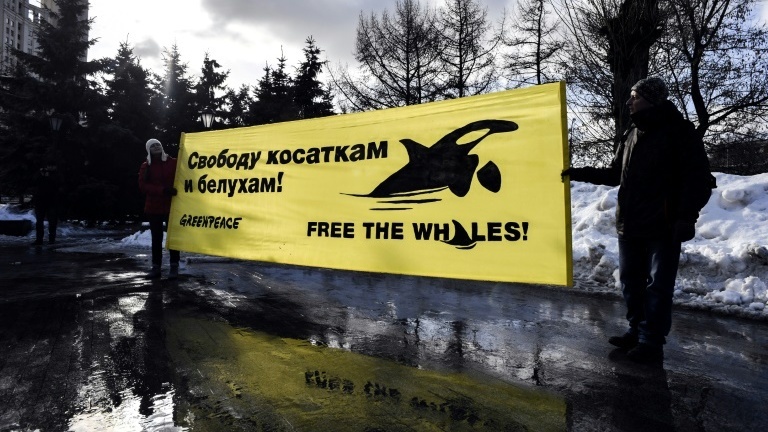 “Orcas are like the cherry on the cake” for new Chinese venues, said Greenpeace Russia campaigner Oganes Targulyan at a recent protest against whale capture. All 17 killer whales that Russia has exported since 2013 – valued at over $1 million each by customs – have gone to China, according to CITES wildlife trade figures. 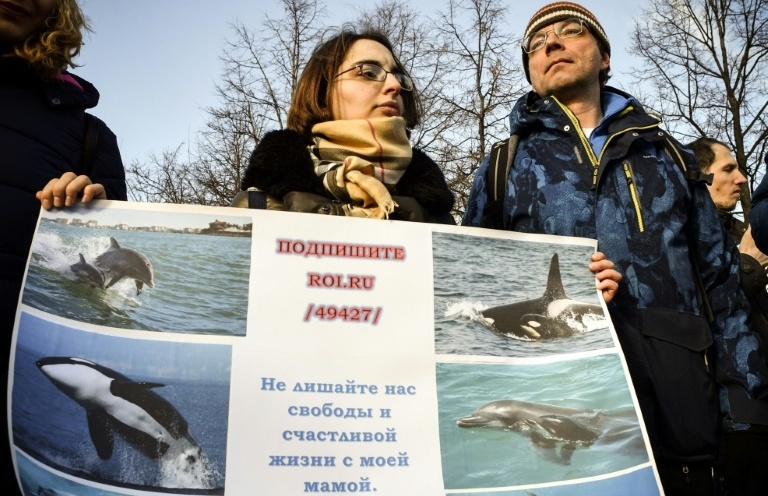 Though the animals in Nakhodka are unlikely to get green-lighted for export, their fate is unclear: it could be up to President Vladimir Putin to make the political decision on their release, campaigner Lisitsyn said. In the West, there is widespread opposition to keeping the highly intelligent marine mammals in parks like the US chain Sea World. But in Russia, public opinion is not so certain. Companies that caught the animals are not giving up. At the weekend, they launched a new Instagram account, praising the Nakhodka facility and defending the oceanarium industry. On Saturday, February 16, dozens of pro-industry supporters disrupted a rally to free the whales. They showed up with signs reading “Each orca is 10 jobs” for the crews hired to catch them, and only left when police arrived on the scene. Researchers meanwhile are already starting to organise to prepare for a potential release of the animals. 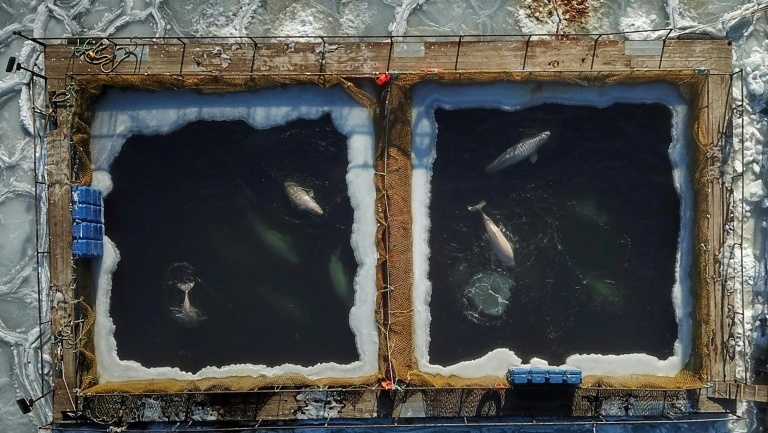 “There have never been so many animals released in the past,” said Dmitry Glazov, a beluga whale researcher at the Severtsov Institute of Ecology and Evolution in Moscow. He said a project of that scale would certainly require international expertise and funding. The whales, which have been fed dead fish, would need to go through an adaptation period to make sure they can rely on their natural food sources.